Book now and save up to 35% off rooms plus receive a $20 food & beverage credit! Be merry and kick start your holiday season with our best rates! Receive up to 35% off our room rates plus a $20 food & beverage credit. Available on select dates, when you make an advanced reservation. Book with any of the following hotels! Things have changed again with the steak special at Ellis Island, but you can still get it for $7.99. $7.99: 10-ounce steak at Ellis Island. Includes potato, bread, green beans and a beer. It is available 24/7 with a player’s card. Ellis Island is located behind Ballys, and is about a 10 minute walk from the strip. The Hammer/Bolan parlay combines both shows and takes into account using discounts available at the casino and a $10 matchplay coupon distributed at the Hammer show. Mike Hammer is a comedic magician. When Hammer hits the stage you know you’re in for a ride. He is a master of cutting wit and non-stop improvisation–every show an original. Hammer’s rapid-fire performance includes an awesome display of mind reading, the swallowing of double-edged razor blades, gags, pranks and general mayhem. BEWARE! Jay Bolan performs in an acoustic retro rock show. Jay does a masterful one-man show that will take you back in time with some of the greatest music ever written. Just a voice and acoustic guitar playing a diverse selection of hits from the 60s, 70s and 80s as only Jay can. One of the town’s best drinking options is located center-Strip at Casino Royale where Michelobs are $1 and a Coors Light draft is 75¢. Station Casinos’ buffets are $4.99 for breakfast, $6.99-$7.99 for lunch, and $8.99-$9.99 for dinner and Sunday brunch at Palace, Boulder, Texas, Sunset, and Santa Fe Stations, and $6.99, $8.99, and $13.99 at Green Valley Ranch and Red Rock, except for Fri. and Sat. specialty nights everywhere except Palace, Boulder, and Texas; must show a Boarding Pass card. Returning to the Top Ten is the three-course lunch special at Estiatorio Milos, in the Cosmopolitan . We took it down in May for a $2 price hike, but it’s too good to leave off the list. The lunch special runs from noon to 2:30 pm, and you can choose from several appetizers and entrées, including Greek salads and preparations of oysters, shrimp, and scallops for the appetizer, and main-course selections such as salmon, tuna burger, chicken brochette, lamb chop, and fish. We now have an even better offer for the Nathan Burton Magic Show. This coupon is for FREE balcony tickets to the show. Drink purchase is not required. The new coupon is attached along with all the instructions on how to redeem these balcony tickets that are 100% free for the guests. 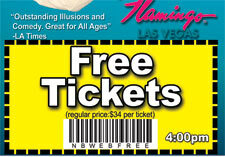 Simply click the coupon picture for printable coupon and more show information. Each coupon is good for up to 4 tickets. I was informed their is no expiration date, so that is even better. This is a vacation package that comes with great low rates along with tons of fantastic perks. Stay with Treasure Island for two nights and they will provide you with two-for-one Mystèreshow tickets and Yard Long Margarita’s. Save money on food at Kahunaville and your poolside cabana. You will even get to try your luck on a mechanical bull. Your next Treasure Island stay will definitely be filled with mystery, adventure and savings. A savings over $150 to be exact. Book your Treasure Island room today!